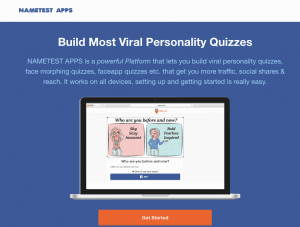 I purchased viral quiz website from nametestapps.com last week. This is my review on nametestapps.com after one week experience on using nametestapps.com. First all of I would like to say is that nametestapps.com is not selling a php viral script. It will not come with ready made php script package with self-installing features. Instead of the script, website will be built by nametestapps team. This is the beauty of nametestapps.com. You don’t need to worry about facing a problem while setting up the website. Just need to provide domain name and hosting access to them. You also need to set up your own Facebook app if your package is not included FB app service. It takes completely one day to hand over fully working website to you. My satisfaction level on my website developed by nametestapps is very high. It offers the features which are not included in any other php viral scripts in the market. It can create quizzes like face morphing, Face swapping. And during this time, most of the php viral scripts are struggling to show user profile pictures on the quiz results, but we don’t need to worry about this issue with nametestapps. It can create quiz results with user profile pictures. They will provide you with detailed writing documents on how to request Facebook permission for quiz features which use Facebook items (eg. user_photos, user_gender, user_birthday etc) and also complete document to create a quiz which is really helpful. We can make profile into circle. I started with 199 USD package, but will upgrade to next plan in coming week. Even with Basic plan, there is a lots to use. I am very existing to upgrade next plan soon. As website is created by their team, we may not fully understand about website structure and system behind (But I think it is not necessary for most of the users). 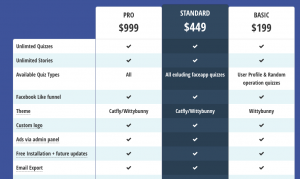 Price is higher than other php viral scripts. But it is understandable. As with this price, you can get fully support till your website is running without any problems. So the price is worth with their complete service. Support email is very responsive and live chat is also very friendly and helpful. To summarize, nametestapps.com is worth to try and it offers the best experience of quiz website. You will get nametests.com looks like website with 199 USD. As I only have one week experience on it, I am not able to write in very detail. I will update my findings and experience later as I know more about it time to time. Can you provide more information about the scrit? Is it possible to generate results by gender? Is it possible to generate results with friends? What application permissions on facebook do I have to own? It is not a script. Developer will develop a website for you using their framework. So that it is more reliable than other. 199 version is basic package which can create random results. Which doesn’t include gender, user_photos and user_friends features. 449 package will give you everything expect Face application. I would recommend you to start with 199 package, even though it is basic, it can create some awesome result like changing your profile picture into pencil sketch, drawing, etc. For basic version, you don’t need to apply anything from Facebook as user profile and user name is approved for default. But for 449 package, you have to request user_gender, user_photos and user_friends for permission. One good thing of nametestapps is they can adjust according to Facebook’s changes. As a Facebook’s recent change, when website user number hit at one point, Facebook throttle your website and you will not able to generate any results. Most of the script cannot handle it. But nametestapps can adjust this issue. I have faced it and they helped me to solve it. Here I just created new post. Update on viral scripts. Do you mean nametestapps? Nametestapps is the best quiz website I have tried so far especially for the help and support.